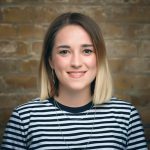 In the search for the best modern conference venues London has to hire, you want to find a flawless fit. We’ve provided you with a top 10 list of diverse and dazzling conference Spaces. Take a look through and you’re sure to find the ideal option for your next conference. Located in London’s vibrant East End, Curzon Aldgate is the ideal modern conference hire. 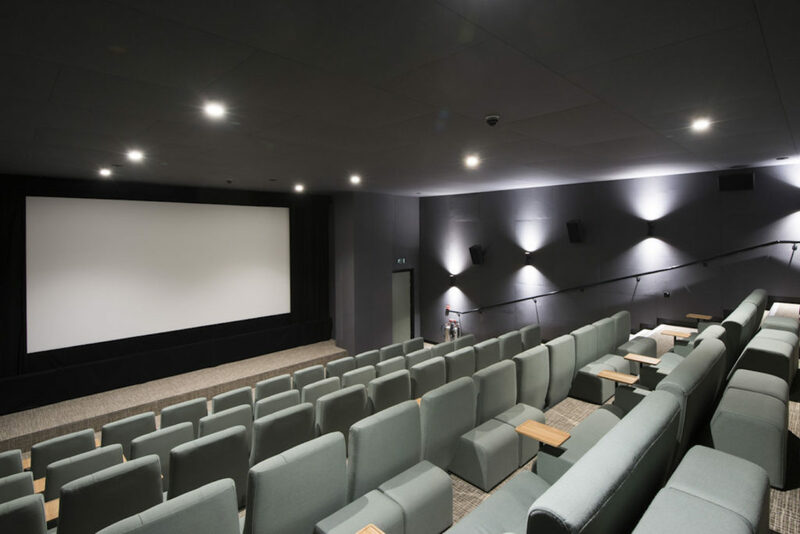 Equipped with high tech Dolby sound and Barco digital projection, Curzon’s cinema screens are perfect for presentations and film screenings. Thinking of hosting a drinks reception after your screening? The venue also features a spacious bar area, available alongside a screen hire or only for a reception. With a 76-seater screen, comfortable seating and sleek design, Curzon is the perfect mix of stylish and functional. For a truly versatile conference venue, look no further than the Guy Whittle Auditorium. 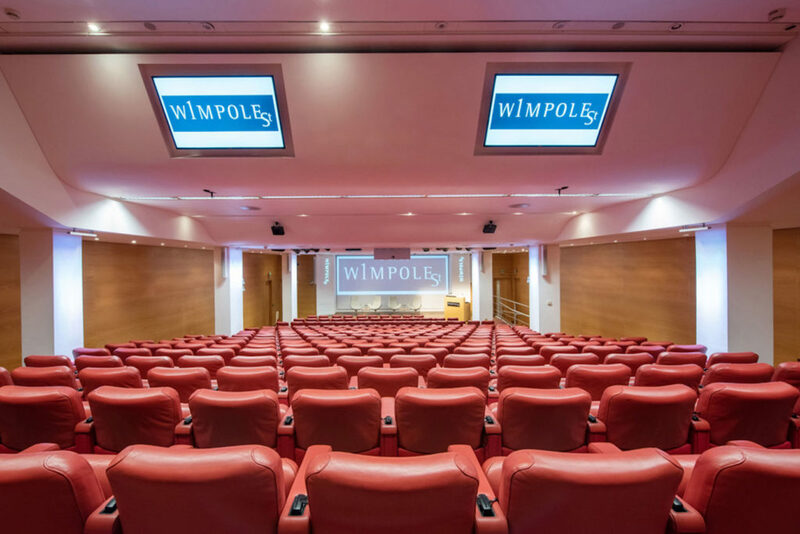 This spacious venue comes equipped with everything you need for your next conference and is the largest Space at 1 Wimpole Street. The luxurious seating means you and your Guests will be comfortable throughout the event, while the pull-out writing desks are ideal for taking notes and jotting down ideas. The Space offers all the necessary amenities, from high-spec sound and video equipment to excellent air-conditioning. Guy Whittle Auditorium can accommodate up to 300 people theatre-style. No matter the size and style of your next conference, this Space is sure to impress and inspire your Guests. 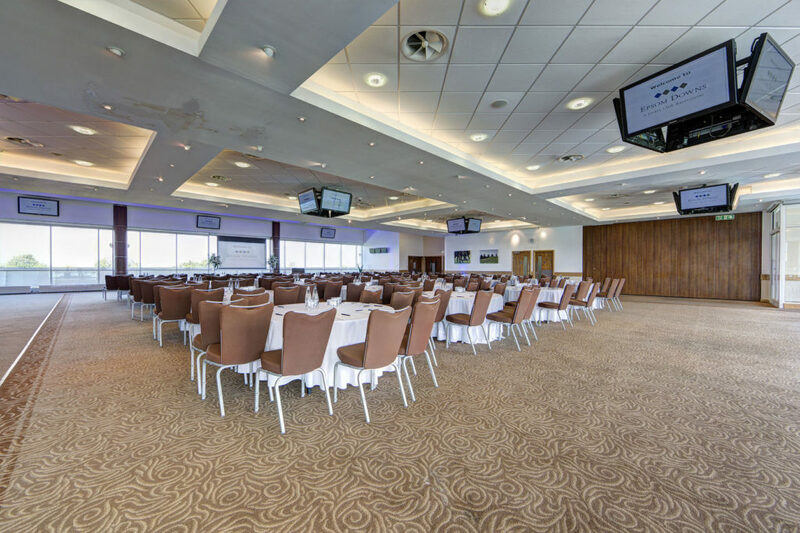 If you’re hosting a large-scale conference and need a venue, Epsom Downs Racecourse offer plenty of stunning Spaces to choose from. From large conference halls with a stunning park views to smaller, more intimate conference Spaces, this venue has something for everyone. Among the many sleek and flexible Space Epsom Downs has to offer, the Diomed Suite is an excellent, go-to choice to host a seamless conference, complete with comfortable seating and calming interiors. Located just 30 minutes from Central London, Epsom Downs’ conference Spaces come with everything you need to host a successful event, from high-end technology to award-winning catering capabilities. Don’t miss the option to book rooms with sweeping views across the downs and the racecourse for a conference experience like no other. For a flexible conference space to hire in the heart of London, look no further than 58 VE. With state-of-the-art technology spread out across a contemporary area 58 VE is an ideal venue for any conference, seminar or workshop. The versatile cutting edge space has everything you need to keep your audience focused on your speaker’s presentation and broadcast your event beyond the venue with first-class AV. 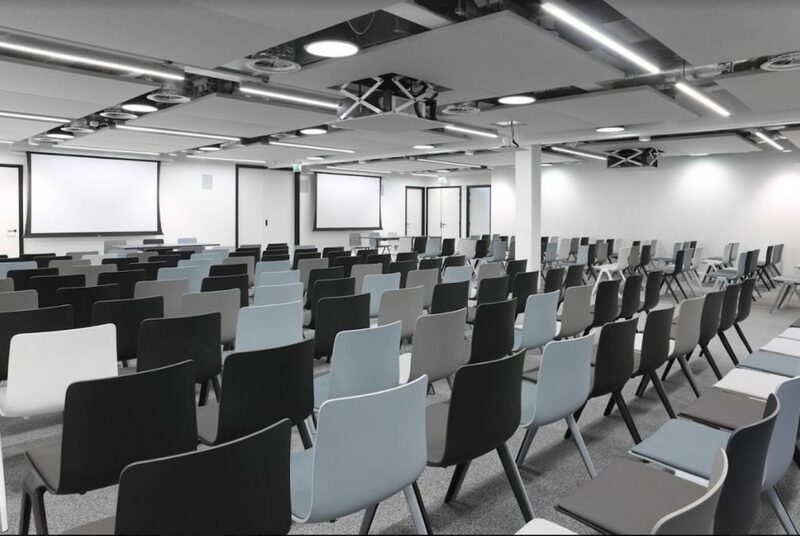 LABS Holborn is first on our list of the modern conferences venues London has to offer. This conference Space features an industrial edge and has capacity for 100 Guests. 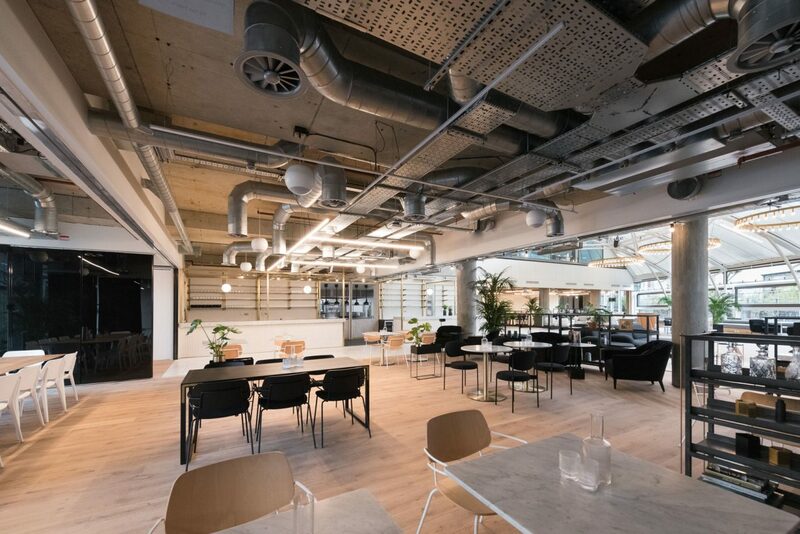 LABS Holborn provides a Space that combines advanced technology with a quirky finish. Impress your Guests with contemporary quality and incredible facilities. The Conference Space at LABS Holborn is just a short distance from Holborn tube station. An effective and convenient Space for your next conference room hire in London. Our next London conference venue is brought to you by RIBA Venues. Jarvis Hall is equipped for audio and video conferencing. This conference venue’s capacity accommodates up to 400 Guests. This Space can provide anything you may require for a corporate event of any size. Jarvis Hall supplies a sublime option for events of any size. Located between Marylebone and Fitzrovia it’s a gorgeous venue to hire in London. Warm and welcoming decor in this conference room ensures a relaxed ambience for every event. The Living Room at The Hoxton Holborn offers an inviting feel for conference hire. Plush furnishings elevate this Space above your usual conference room. The lighting enriches the decor in this Space and creates a perfect choice for conference venue hire. This home from home conference room can facilitate between 18 and 80 Guests. A great spot to host your next corporate event. Our list of the modern conference venues London has to offer presents an incredible range. This iconic London location is next in line. The Design Museum offers Guests inspiration upon entry with astounding architectural features, the monochrome decor and refined furnishings create a conference Space with great style. This conference Space offers a central location and High Street Kensington is just a stone’s throw away. The stunning green surroundings offers Guests a beautiful setting for your next corporate event. Host up to 202 Guests in this contemporary conference venue. Camden House offers a conference Space where industrial industrial features create a superb venue hire London. This venue also boasts a highly regarded reputation. Your Guests are ensured a fresh yet focused conference. Zone 2 is an impeccable choice and offers on-site technical support. Whatever you need for your conference will be provided at Camden House. This Space is capable of hosting 150 Guests in a theatre-style layout. Zone 2 is a faultless conference Space in the ever popular area of Camden. The quirky and hipster area of Shoreditch is a great destiantion to hold a conference. Inspire your Guests with a modern conference venue nestled in a hive of activity. The Atrium offers an airy and atmospheric option for conference room hire in East London. Its minimalist design and stylish decor presents Guests with a blank canvas. Space A is ideal for workshops as well as conferences. The Atrium allows up to 100 Guests to personalise the room to suit their individual needs. This is a highly sought-after Space amongst the modern conference venues London has on offer. Spacious and suitable for any occasion, Store Street Room at One Alfred Place presents a top choice for conference venue hire in Fitzrovia. Store Street Room is a blank canvas Space with a welcoming atmosphere. This conference Space connects homely touches with classic office furnishings. The comfortable furniture adds a pop of colour into this crisp, white room. Store Street Room offers facilities from whiteboards and flip-charts to HD projectors and speakers. Store Street Room’s capacity of 100 Guests solidifies this Space as a top choice for conference room hire in London. Kings Cross presents a conference Space ideal for impressing your corporate clients. Versatile and effective, this Space is everything you’ll need for a great conference. Wooden flooring and contemporary designed furniture fill this conference room. Hall Two also features a stage that is ideal for lectures and presentations. The theatre style capacity of 200 Guests makes sure that any scale of event can be comfortably hosted in this Space. Hall Two is a short distance from Kings Cross and St Pancras International. Your commuting and international Guests will have no trouble locating the venue as it is proudly placed by Regent’s Canal. A top choice for your next event. This conference Space offers contemporary furnishings with a homely touch. In our list of the modern conferences venues London has to offer, The Lab is a desirable option. This conference Space offers full use of the kitchen facilities as well as a bright area to host daytime company events. This Space is an accommodating choice for conference room hire. Its capacity of 60 Guests allows for informal and formal set-ups for an array of conference styles and events. Last on our list of the modern conference venues London has to offer is the Events Space at 66 East Smithfield. This conference room is bright and contemporary and has everything you’ll need for a focused event. The Events Space enables audio recording and video conferencing facilities. An accommodating and efficient choice, its’ position by Tower Hill tube station makes it convenient for your Guests to locate. This conference Space hire is the ideal location for 150 Guests to partake in a successful event. This list gives you marvellously modern choices that are sure to give you everything you’ll need for a convenient and efficient venue hire.